Mountain View Grand Resort & Spa has spent the last several years running online raffles in order to grow a strong email list. In this case study, we’ve laid out the steps Mountain View Grand Resort & Spa used to plan and execute a giveaway campaign that resulted in a 78% increase in raffle entries and a 141% increase in campaign views compared to their previous average. As Mountain View Grand learned, a marketing campaign is only successful if it motivates existing and potential customers to engage, and converts more visitors into qualified leads. 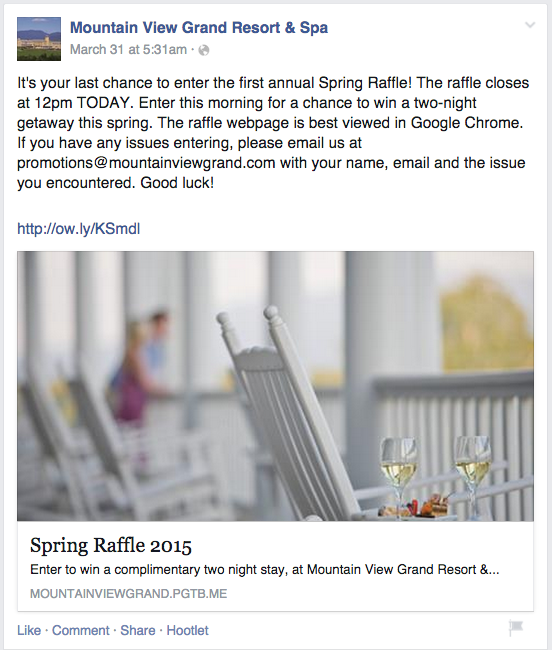 Why Mountain View Grand decided to run a giveaway separate from their Facebook Page. Where they decided to host their giveaway in an attempt to increase traffic and engagement. Why email is such an important communication tool for Mountain View Grand. Here’s a step-by-step look at what Mountain View Grand Resort & Spa did to increase raffle entries by 78% and tips for how you can apply them to your own Campaigns. Businesses run campaigns in order to reach a goal and solve a problem. Mountain View Grand Resort & Spa had been running raffle giveaways for several years with the main goal being to grow their email list. They were hosting their giveaways on their Facebook Page and asking their fans to enter through Facebook. While their goal was focused, Mountain View Grand Resort’s execution had some flaws. Every time they would promote their raffle to their existing email list Mountain View Grand Resort & Spa reps would receive feedback from users saying they did not have a Facebook Page and therefore had no way to enter. Mountain View Grand was left to enter these people into the giveaway manually. It became clear that maintaining two forms was not ideal. Leani and her team needed a better solution. The takeaway: Pay attention to where your audience is online. Having been long-time ShortStack users, Mountain View Grand was familiar with the option to publish their Campaigns as stand-alone web or “landing” pages. Once Mountain View Grand decided it was too difficult to maintain two data collection forms for each raffle, they decided to publish their form to the web where it would function as a landing page and give them one central place to collect entries. From there, Mountain View Grand promoted their raffle giveaway from their Facebook page, their website, and their newsletter. The takeaway: Focusing on the user experience will result in more traffic and entries into your promotion. After adjusting their publishing strategy, Mountain View Grand saw a 78% increase in entrants into their raffle. In addition, they received a 141% increase in Campaign views compared to their previous raffles. Mountain View Grand adhered to same the promotion tactics for this giveaway that they had for previous efforts: They used Facebook, their website and their existing email list to promote the giveaway. The hotel continues to communicate with their email subscribers and even saw a higher click- through rate on their most recent raffle email. Mountain View Grand’s raffles began as a means to collect email addresses and grow their Facebook Page. Now, several years later, their goal continues to be to grow their email list, but they prefer to drive traffic to their website and use Facebook as a tool to do that. By listening to their online followers and adjusting some of their strategies, Mountain View Grand was able to rework the delivery of their raffles, making it easier for their audience to enter. Ultimately this made Mountain View Grand’s promotions more successful. The takeaway: A business’s website should always be the main source of information and social media should be used as a tool to drive traffic back to the website.